A baby was baptised at birth because doctors gave her such a low chance of survival has made a full recovery. 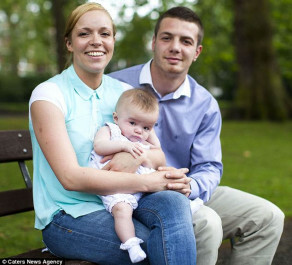 Mother Kellie Burville, 27, developed a rare condition during pregnancy that caused her body to attack her unborn baby. Doctors said there was a high risk that her daughter would be so severely brain damaged she wouldn’t survive and she was given the option of having a termination. But Kellie, who was nearly full-term, decided to continue with her pregnancy. Even after her baby was born, Kellie and partner Callum Campbell from south London were advised to get their daughter baptised because she wasn’t expected to live longer than a few hours. However, although their daughter Logan was dangerously ill at birth, she stunned medics by making a rapid improvement and is now progressing well. Ms Burville said: ‘I had gone through my whole pregnancy looking forward to having my first child. I was determined to go through with it. At 36 weeks pregnant, Kellie was told her baby might be in the breech position, which could cause complications during birth. She was sent for a scan a week later to see if her baby could be turned. Kellie, a full-time mother, said: ‘When he started scanning my stomach he went quiet. He went to the consultant but she had gone home for the day and he told us we needed to come back on Monday. The following Monday, the consultant delivered the devastating news the couple’s baby had suffered a brain bleed and she would be severely brain damaged. They were told she was not expected to survive and the couple were offered a range of options, including a termination. Kellie said: ‘Our whole world fell apart in that moment. I looked at Callum and burst into tears. ‘I’d just had my baby shower a couple of days before. We already knew we were having a girl and had bought everything for her. We’d been so excited. ‘The doctor explained that if she did survive, she wouldn’t be able to walk or talk. She wouldn’t be able to feed and wouldn’t know who we were. The scan showed Logan’s head was twice the normal size because of the amount of fluid on her brain and a natural birth would be impossible. 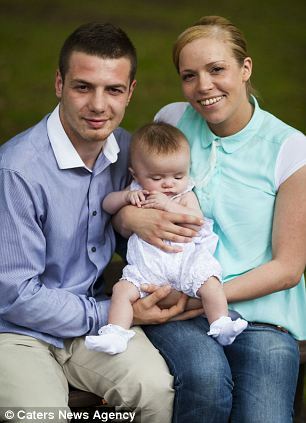 Kellie said: ‘They had already told us they wouldn’t do anything for her or give her any treatment after she was born. They weren’t expecting her to live. ‘Callum and I tried not to think about it but we picked some songs we wanted playing at her funeral. 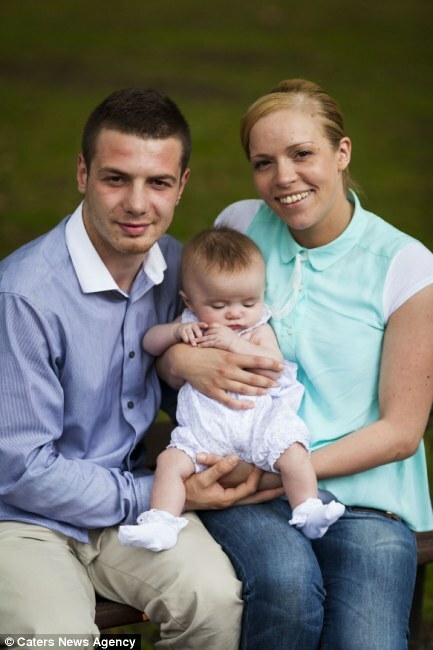 A caesarean section was scheduled the week before Kellie’s due date and Logan was born weighing 5lb 5oz. Tests revealed Logan had a platelet count of just five – dangerously low. A newborn baby should have a level between 150 and 450. Logan was given a blood transfusion to help boost her platelet levels. The couple were placed in a private room to spend what little time they had left with their daughter. Kellie said: ‘A midwife asked if we wanted to see a chaplain to get her baptised. My tummy had already been blessed before the birth. An MRI scan the next day showed fluid had build up in the brain, pushing it against the skull and causing a brain bleed. Doctors were still baffled by what was behind it and initially put it down to an infection during pregnancy. 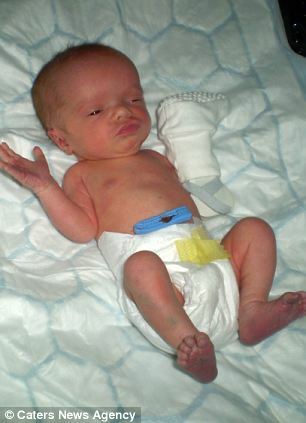 However, at four-days-old Logan was diagnosed with the potentially fatal Neonatal Alloimmune Thrombocytopenia (or NAIT), where the mother’s body treats her unborn baby as a harmful invader. The condition causes the mother to make antibodies that attack the baby’s platelets. This can cause babies to bleed into their brain, stomach or spinal chord during pregnancy or shortly after birth. 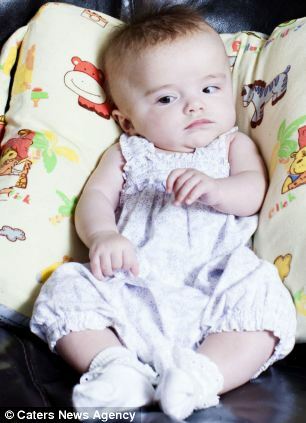 Babies can be at serious risk of brain damage or even death. It is so rare, the condition was only discovered after Kellie’s sister typed Logan’s symptoms into an online search engine and came across a charity called Nait Babies. She passed the information onto doctors and a simple blood test confirmed the diagnosis. Doctors were happy with Logan’s platelet count and she was allowed home the same day. Four months on, Logan has confounded medical opinion and her parents believe she will live a normal life. Logan’s consultant was planning to insert a shunt to help drain any fluid from her brain but Kellie has been told there is currently no need. Kellie said: ‘She’s doing everything you would expect of a healthy baby. She’s hitting all her milestones. Logan’s father, 23, said: ‘I was scared but I didn’t want to express how I felt because I had to be there for Kellie. I had to stay strong but inside I didn’t know what would happen. A spokesman for Chelsea and Westminster Hospital said: ‘When Kellie Burville was 37 weeks pregnant, we carried out scans which showed that her unborn baby had a brain bleed. ‘Our doctors discussed the implications of this with Kellie and her partner who were offered a range of choices including terminating the pregnancy because there was a more than 50% risk of serious handicap to her unborn child. ‘Kellie and her partner were not advised to terminate her pregnancy, they were offered choices which included termination. ‘We fully supported Kellie and her partner in their choice to continue with the pregnancy and we delivered their baby by Caesarean section and then provided treatment after Logan was born on our Neonatal Intensive Care Unit.